If you’re looking for ideas to continue churning out quality content for your readers, here are 10 tips to get you started, regardless of your niche. It touches on writing with passion and offers ideas to start a new set of articles. When you’re caught up with those tips, don’t forget to come back here for more valuable articles from our list! Not every author can come up with brilliant, innovative ideas for content every day. Our next blog focuses on ways you can stand out in your niche and make a bigger splash for your audience. Learn how to attract new readers with more creativity and time management. While we have an assortment of articles to help you improve your writing and connect with your readers, we also identify common mistakes authors can make. This article will help clear up some of these. Make sure you’re prepared for your next writing endeavor! Staying on the same topic of oversights or mistakes authors can encounter, our next blog directs your attention to article submissions. Many of the blunders listed here are common sense precautions; however, we highly recommend checking them out just to be safe. You may be an expert author with an infinite amount of knowledge on your niche, but you could still be ending your article incorrectly! We’re talking about your Resource Box, which is a very important part of your article. Check out what we have to say about serving up the best Resource Box to benefit both you and your readers. 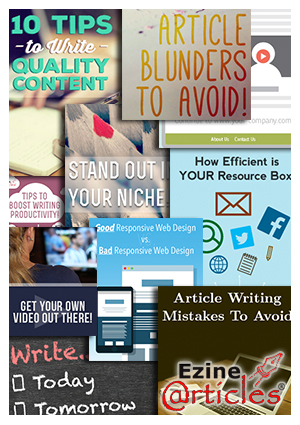 We’re still shining the spotlight on the Resource Box in these next few blogs, but the focus is now on your website. Linking to pages that are informative and straight to the point is important for an author who focuses on articles. If you’re curious to know what makes up an exceptional squeeze page, we have you covered! Once you’re more familiar with squeeze pages, this next article will focus on one area that can give you an edge over other authors in the same niche … videos! Creating a short video of yourself and/or your products will make an immediate impression with your viewers. See what we have to say about using them on your squeeze page! How much do you know about responsive web design? How much should you know? We’ve had a few blogs on this topic; however, we have one that clearly separates the Dos and Don’ts when you’re thinking of going this route. Here is a more educational and tech savvy blog that will give you a better perspective on the urgency of making mobile users pleased with your website. Take a look for yourself! With these last 2 articles we’re back on the subject of assisting you with your writing efforts. You may have ideas and goals for your writing, but they will just be in your head unless you have the proper motivation! Read up on a few helpful tips to boost productivity and keep your progress going in the right direction. #10. End Your Procrastination and Get Back into Writing Mode! The last blog on our list focuses on many authors’ least favorite word: Procrastination. We need to stress the importance of having passion for your work and never falling too far behind. Procrastination can and will destroy productivity. You need to have faith in your writing and the knowledge you’ve obtained. Quickly learn some tips on breaking out of a funk and staying motivated to meet your goals! 1. Do you have a favorite article out of our list? What made it stand out for you? 2. What topic would you like us to write about in a future blog? We would love to hear your thoughts on these questions. Use the comment section below to share them with us! Thanks for sharing these tips with us. Keep posting these types of blog, it helps a lot. Thank you for the generous sharing of articles! I appreciate number 1 and 2 the most because writing awesome content and providing something special for others is always a priority for me. Keep up the good work! Thanks Derek! I will keep in mind these important tips before submitting any article. I found that every article above had information that nudges our memory in all the trivial and important points in writing that can be of great use to us. I appreciate your great rules about blog post. I will keep in mind these important tips before submitting any article. thank you so much…. Great article and tips to get me prepared for fall. Number 4 and 10 were the most useful. As a web designer myself, #8 (good vs bad responsive design) was very enlightening. With more and more users searching the web via their mobile devices, these sites will make you look good on smaller screens. Thanks for sharing. A very nice article written here, and also some others post too which links is shared here. I thank you for sharing this. I find that article pretty useful. Wonderful article. Very useful to beginners. Keep on publish such useful articles to beginners. Also help beginners how to choose article titles and what is the current trend in article writings. A very nice article written here, and also some others posts too which links are shared here. Nice articles all are beautifully written and these are very informative. Thanks. For youth generation this type of article was totally boring, but your article was fully different and realistic to the young generation for the future life. A very nice article written here, and also some other posts too which links are shared here. I thank you for sharing this. I find that article pretty useful. Yes a great collection of blog posts which you should really consider reading this year. Thank you for such a great article and a very helpful one. We absolutely love your blog and find nearly all of your posts to be just what I’m looking for. I’ll bookmark your blog and check once more here regularly. I am quite sure I’ll be informed of a lot of new stuff right here! Best of luck for the next!